The Hartford Hospital Auxiliary provides service and monetary funds for improvements and enhancements to the hospital community. Auxiliary funding benefits patients, family members, visitors, employees, and volunteers. Through membership dues and donations, fundraising events and store revenues, the Auxiliary funds project grants and annual gifts in all areas of the hospital. It is led by a volunteer, self-governed board of directors that also invests hours of service to maintain the many programs it serves. Founded in 1921, the Hartford Hospital Auxiliary started its rich history by making bandages, clothing and other items needed by the hospital. During WWII many auxiliary members volunteered their time as nurse’s aides. This allowed the administration to keep open an additional third of the hospital. Fast forward to today, our self-governing organization provides services to all aspects of Hartford Hospital. We report to the Hospital's administration and work along side the hospital staff to provide volunteers and monetary support. The funds raised through our events support necessary equipment and training that ultimately help provide the best patient care. Additionally our efforts fund scholarships for volunteers, employees and their children and many other annual commitments. If this sound like the type of organization you would like to explore. Join Us! Axe throwing and FUN to support Hartford Hospital, the Center for Education, Simulation and Innovation and its newest piece of technology... Axel the Sim Dog - a state-of-the-art, hands-on canine training simulator! Designed in partnership with the Department of Defense for canine first responders, Axel is the 1st Sim Dog in the U.S. to be used as a training tool in a healthcare education environment. Feb. 25, 2019: Hartford HealthCare unveiled a new training tool for law enforcement canine officers to help provide life-saving trauma care to their four-legged partners. Axel, a dog mannequin, provides hands-on training opportunities for police by simulating everything from a broken bone to a gunshot wound. The Hartford Hospital Auxiliary partnered with the Center for Education, Simulation and Innovation (CESI) department to purchase the simulator. It is the first of its kind in the country to be used in a hospital environment. You are welcome to meet Axel at the “Rx for Fun" event! Click for details. 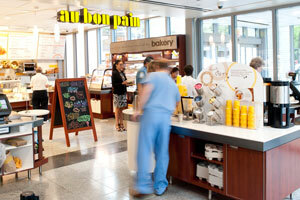 The Auxiliary’s relationship with Au Bon Pain Café continues to be strong. Located in the main lobby of Hartford Hospital, the café has been very well received by the hospital community and its guests. In addition to offering freshly prepared sandwiches, salads and desserts on site, the café extends its services to catering breakfast, lunch and snack options for hospital meetings and group gatherings. All Au Bon Pain purchases benefit the Hartford Hospital community, as all fees the Auxiliary receives from Au Bon Pain go into the funds the Auxiliary uses to support important hospital projects. The Auxiliary Store opened on October 5, 1943 at the request of Hospital administration and for the sole benefit of the hospital. 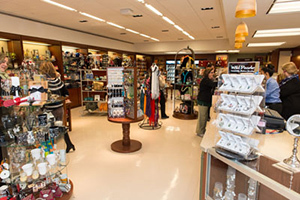 The current store, located past the elevators in the main hospital, continues to benefit the hospital community today. Since its inception, Auxiliary members and volunteers have given endless hours of service to staff the store. For continuity of service and revenue, the Auxiliary partnered with a professional management company in 2015. All purchases made at the store directly benefit the hospital community. 100% of Auxiliary fees received from the store support hospital project funding. The Auxiliary Board works to ensure that store merchandise selection and quality continue to meet customer needs. Staff and visitors will find a large variety of reading material, cards, flowers, balloons, toiletries, gifts, and snacks. Your feedback on quality and selection is always welcome. Learn more about The Auxiliary Store. In 1968, the Auxiliary established the scholarship fund for children of Hartford Hospital employees. Today, the Auxiliary funds up to $75,000 annually in undergraduate scholarships for children of employees. The Sons and Daughters Scholarships are competitive, one-time, merit-based awards of $1,000 to $10,000. The top award of up to $10,000, is given in honor of Hazel Vail, an Auxiliary Board Member from 1992 to 2015. Established in 2016, this award honors Hazel, a volunteer at Hartford Hospital since 1979, who has dedicated over 15,000 hours of service. To apply, employees can visit the hospital intranet under Human Resources / Education / HH Scholarships. The Auxiliary funds the early childhood literacy initiative at Hartford Hospital. This $30,000 annual commitment, implemented by the Auxiliary Board in 2008, brought the Connecticut-based Read to Grow “Books for Babies” program to the hospital. Literacy information is provided to new moms, trained volunteers meet with parents and families, and books are provided for newborns and siblings. “Books for Babies” helps parents understand how books and reading play a role in developing language skills, starting from birth. It is an effective and powerful strategy. Auxiliary members also donate nearly 1,000 books annually to the program, directly serving the over 3500 babies born annually at Hartford Hospital. A holiday treat for hospital employees, the Auxiliary commits $10,000 towards the cost of this annual December event. Working with the hospital Human Resources Department for many years, Auxiliary board members also volunteer to make this a special day for staff. The Auxiliary is on hand to support kitchen staff in keeping the food well-stocked and ready for employees. The Auxiliary has played an active role in enhancing the physical appearance of our hospital spaces since the 1930’s. Today, the Auxiliary provides fresh flowers for the main lobby and multi-faith chapel. Arrangements are updated monthly and purchased through the Auxiliary Store florist to brighten the spaces throughout the year. In support of Volunteer Services, the Auxiliary funds an annual Volunteer Scholarship to a deserving high school senior who is a VolunTeen at Hartford Hospital. Eligible VolunTeens must be planning to pursue a medical or healthcare related field of study. In collaboration with Volunteer Services, the Auxiliary has funded the yarn for the knitting program since the mid 1980’s. Currently, members of the Aetna Volunteer Council give their time and talents to create lap afghans, caps, baby afghans, and baby hats for Hartford Hospital patients. Your contribution, at any level or amount, makes an impact! Auxiliary funds make it possible to respond to the needs identified by staff, which are not covered under the hospital budget. We fund department initiatives, equipment upgrades, facility improvements, new technology, training, and more, to ultimately benefit patients, family members, visitors, employees, and volunteers. 100% of member donations support project grants and annual gifts throughout the hospital. Membership brochures are located in the Auxiliary Store, or click here to download and mail a membership form. The Hartford Hospital Auxiliary is pleased to announce that it voted on October 9, 2018, to fund eighteen projects totaling over $242,000. The Hartford Hospital Auxiliary is pleased to announce that it voted on April 17, 2018, to fund sixteen projects totaling over $225,000. The Hartford Hospital Auxiliary has always been a strong supporter of the Brownstone and its service to the local community, and 2015 was no exception. This past year, the Auxiliary donated a total of $350,000 to the Brownstone Relocation project. Every October, the Auxiliary Board reviews proposals for our annual Fall projects. This year one particular project stood out. It was a touching story about a mother and daughter who were both diagnosed with Ovarian Cancer and both treated at Hartford Hospital’s Helen and Harry Gray Cancer Center. Members of the Hartford Hospital Auxiliary and the medical staff welcome a new beside ultrasound machine to the Medical Intensive Care Unit on Bliss 11. Nominated for election at the 2018 Hartford Hospital Auxiliary Annual Meeting, Shelley Dodd will join continuing Co-President Jennifer Wedeles as the Co-President of the Auxiliary. If you found it hard to get into the holiday spirit, then you should have joined all the Hartford Hospital Auxiliary Board volunteers at the December first annual daytime Employee Holiday Party. The Hartford Hospital Auxiliary Annual Benefit Golf Tournament took place on September 17th at the Tumble Brook Country Club in Bloomfield. Once again, the tournament was an amazing success, with net proceeds of $380,000. On November 30th, the Auxiliary held another successful holiday plant sale. Similar to last year, we limited our Poinsettia sales to pre-orders only and we continue to be happy with our results. Read to Grow focuses on improving early childhood literacy. The Hartford Hospital Auxiliary fully supports funding of the program at Hartford Hospital. Each Spring the Auxiliary sponsors our “Rx for Fun” event, which is designed to bring Auxiliary members and friends together for a fun evening while raising money and awareness for a particular project or department at Hartford Hospital. In May, 2018, The Hartford Hospital Auxiliary Board awarded 33 scholarships totaling $60,000, to children of Hartford Hospital employees. The Hartford Hospital Auxiliary has named Numair Akhtar and Caroline Nisbet recipients of the 2018 Adult Volunteer and VolunTeen Scholarships.